POC'S WIFE ASKS SOVIET LEADER FOR PERMISSION TO VISIT HUSBAND New York - Avital Shcharansky, wife of Prisoner of Conscience Anatoly Shcharansky, at a recent press conference to discuss her husband's condition in light of a report by Soviet leader Yuri Andropov that he had ended his hunger strike, begun over 125 days ago in Chistopol prison. Mrs. Shcharansky appealed on humanitarian grounds that his mother be permitted to see her husband and verify his condition. Flanking her were representatives of organizations which convened the press conference. 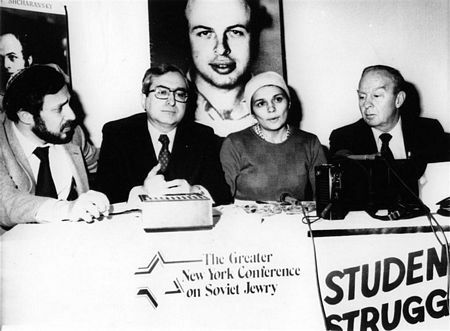 From L-R: Avi Weiss, Student Struggle for Soviet Jewry, Seymour Lachman, Chairman, Greater New York Conference on Soviet Jewry, and Eugene Gold, past Chairman, National Conference on Soviet Jewry and former Kings County (Brooklyn) District Attorney.